James Aspinall, who worked as a clerk in Liverpool, travelled to the game with a friend, Graham Wright, who also died. I, David Aspinall, have the privilege of reading the pen portrait of my brother James Gary Aspinall, on behalf of my mum and dad, my brother Andrew and my sisters Kerry and Louise. James was born on 13 March, 1971 at Broadgreen Hospital in Liverpool and was the eldest of five children to Margaret and Jimmy Aspinall. Growing up, I remember our 'Ja' doing the usual boys' things that included playing football, cricket and bike riding, although football was his real passion. This love for football came about on 2 September, 1978 when James attended his first ever football match at Anfield with Dad. Liverpool went on to record an impressive 7-0 win against Tottenham Hotspur and this left an indelible mark on James for all things LFC. James took a shine to goalkeeping and, before long, he was playing in this position for St Joseph's Junior School in Huyton. When old enough, he joined the local football team called Rayton Rovers based in Rainhill. The medal collection that James won soon became a small pile of clutter scattered around every shelf in the house. Although this must have frustrated our house-proud mum, the sense of pride and her encouragement would always outweigh any reason to declutter. James also had a natural sense of adventure. He would always use the family holidays to North Wales as a way of getting some peace and quiet away from the child-noisy Aspinall household. He would often walk down to the beach for hours at a time on his own and was never interested in pestering Mum and Dad for money to waste at fairgrounds or arcades. Being close to nature was enough for our Ja. On one holiday to Spain, Dad decided he would teach me and James to swim down at the pool. Dad was urging James to swim towards him in the shallow end of the pool. Dad continued taking small steps backward in the shallow water to encourage James to swim further. However, as Dad took a further step back, he plunged without warning into the deep end. Unknown to us, Dad could not swim and only the brave efforts of a few holidaymakers upon hearing James' and mum's cries for help prevented a tragedy in front of our very eyes. James would leave Dad red-faced at family gatherings for many years after this incident, recounting the story in his non-offensive but very sharp-witted style of the time he was giving swimming lessons from a person who could not actually swim. It is quite ironic that many years later at Hillsborough, Dad could only watch from the side pen of the Leppings Lane terrace as his eldest son's future disappeared in such harrowing circumstances, powerless to help his son when it was most needed. Dad has never attended a football match since that day. As the eldest, James was naturally looked upon as the role model by us younger siblings. At the time of Hillsborough, I was 15, Kerry nine, Andrew seven and Louise five. James shared a bedroom with me and our younger brother Andrew. Never once did James complain about this awkward set-up, even though there were many arguments caused by his spotty 15-year-old brother 'borrowing' clothes, aftershave and deodorant. At an early age, James stood out for his kind, hard working nature. When he turned 13, he began working as a paper boy for the local newsagent and I can still see him now, leaning to one side on his prized Chopper bicycle, paper bag around his left shoulder, cursing about how much heavier the Sunday papers were compared to the midweek editions. James continued this paper round until he was 15 and it was then that he started caddying for an elderly man at Huyton and Prescot Golf Club every Sunday morning. Although encouraged to stay on at school, our Ja decided that, if he could get a decent job, he'd rather take that route. At 16, James decided to accept a youth training scheme at Blake's car dealership in Liverpool. Although he quickly realised this was not really his forte, he persisted with this role until he saw a much more promising opportunity as a shipping clerk in a company called Lamport and Holt. He applied and was offered an interview. On the very day James had this interview and returned back to his current employers, Mum received a call from Lamport and Holt. It was James's future and last ever boss on the phone and he stated he had been so impressed with James that he had no hesitation in offering him the job even though further interviews were yet to take place. It must have been a surreal experience for James when he got home from work that evening, being offered a job in a shipping company by one very proud mother. James's kind nature shone out throughout this time. Even though he had been working in a full time job since he was 16, he would still be called every Sunday morning by the elderly gentleman asking if he would caddy for him around the golf course. James no longer wanted to carry a heavy golf bag around every Sunday morning, especially after working all week, but he continued to do this out of respect and loyalty to the gentleman and not the meagre £4 he would get paid for this heavy, four-hour slog. On Sunday 16 April ,1989 the phone rang once more asking if James was available to caddy. I broke the news to the gentleman and the phone went quiet. Sadly, this was the only time James ever let the elderly man down. If there was one word to describe our Ja, it would be 'selfless'. His love for his family always shone through, especially towards his two younger sisters Kerry and Louise, whom he idolised. They still have the last gifts that James bought them. A few weeks before Hillsborough, James also bought his dad a guitar from one of his first pay packets in his new job and this guitar still gives Dad much comfort each time he plays a tune. But it was not gifts which defined our Ja, his simple acts of kindness left a bigger impression. On one occasion, I decided to borrow Ja's new leather belt and, as I left the house, I was caught in the act and Ja was not too pleased and took the belt from me. As I reached the bus stop, which was approximately a quarter of a mile from home, there was a tap on my shoulder and there was Ja with the belt. As he handed it to me he simply stated I should always ask, don't just take. It may have been a simple lesson from an older brother, but it is one that encapsulated his nature and left a lasting impression on me. On another occasion, James came home with a mongrel dog which a rogue had been threatening to leave on the local railway line. Although money was tight in the household, James insisted we could afford to keep it and he stubbornly refused to listen to Mum and Dad's reasoning. It was decided that James could keep the dog on a trial period, provided he took it for walks, and, true to his word, James and 'Rex' became inseparable buddies. Any time anyone spoke about James, Rex would inevitably enter the conversation; they truly were a double act and it was James's sense of compassion and determination that saved Rex from an uncertain future. Even though we were from a happy household, arguments over music would be a regular occurrence, especially when comparing other musicians to James's idol, Chris de Burgh. James would play a song called 'Sailing Away' so much that it became a regular occurrence to hear Mum shouting, 'I wish Chris de Burgh would sail away, lower that bloody music down'. James travelled to Hillsborough with his good friend Graham Wright, who was also killed. They had both been in senior school together and also altar boys at St Aidan's Church in Huyton. The loss of James in such appalling circumstances left a huge hole in the family unit as Mum and Dad have never come to terms with this loss. A darkness fell over our family on 15 April, 1989 and it is only being here now, being allowed to describe what a decent human being James was, that has finally given our family a shard of light into that darkness. 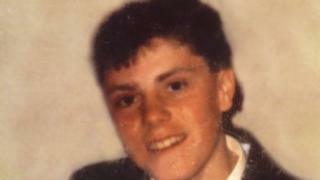 James was 18 years, one month and two days old when his life was painfully cut short at the Hillsborough stadium. On his gravestone is the title of a Chris de Burgh song, 'Carry me like a fire in your Heart'. James has been carried in our hearts every day for the past 25 years. He will always be loved for who he was and what he meant to each and every one of his family.